Honolulu has plenty of parks, gardens and green areas, offering respite from the beach crowds, tourist hotspots and the general bustle of downtown. Lying at the southern end of Waikiki Beach, Kapiolani Park is one of Honolulu's most popular parks, providing a range of sporting and picnicking facilities; while ancient trees and exotic plants are abundant at the spectacular Foster Botanical Gardens in the midst of downtown Honolulu. Most people come to the Byodo-In Temple to see the two-ton wooden Buddha and mock 11th century temple towards the back of the complex. The beautiful gardens set against the striking green cliffs of the Koolau Mountains are next to the temple and feature a huge pond containing 10,000 carp, a meditation house and a three-ton brass bell. Foster Botanical Gardens are most notable as the oldest of Honolulu's botanical gardens. With its perfect setting in the midst of downtown Honolulu, it offers visitors tranquility from the heat of the Hawaiian summer. This ancient 12.5 acre / 5 hectare garden features a range of impressive trees over 150 years old, together with a wonderful collection of tropical plants. Set within an upmarket residential area is Spalding House, formerly the Contemporary Museum, and its outstanding Asian style gardens. These beautiful gardens encompass more than two and a half acres of meticulously groomed flowers, bushes and trees and feature terraces, reflecting pools, stone benches for reading or thinking and amazing views of Diamond Head. Also on the grounds is an excellent café. Located in downtown Honolulu, the Iolani Palace was the former seat of the Hawaii state government and the spectacular 19th century house contains some magnificent European furniture. The grounds are also well worth a look and are free to enter. In the grounds of Honolulu's Iolani Palace is a domed pavilion used as a bandstand for concerts by the Royal Hawaiian Band and the State Archives. 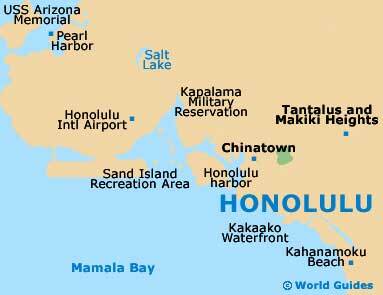 Sandwiched between the prominent Honolulu landmarks of Diamond Head and Waikiki Beach, Kapiolani Beach Park encompasses walking trails, tennis courts, the Waikiki Aquarium and Honolulu Zoo. 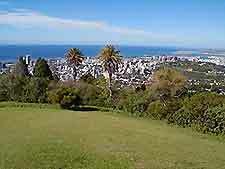 This 136-acre / 55 hectare park is a hive of activity boasting sports facilities and picnic tables. Kapiolani Beach Park is also the venue of the annual Highland Games and many seasonal other events. 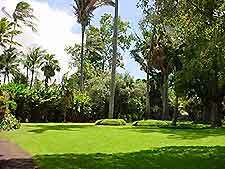 Also part of the Honolulu Botanical Gardens system, the Liliuokalani Botanical Garden is just north of Foster Garden and was once a favorite haunt of Queen Liliuokalani, who would regularly picnic here. Today, this developing garden is loaded with native Hawaiian plants and also encompasses Honolulu's scenic Nuuanu Stream and waterfalls.